he LAB-X18 is intended for development and experimentation using the 18-pin PICmicro microcontrollers, especially those equipped with analog-to-digital converters. The PIC16F88 is recommended for this board. The LAB-X18 contains the circuitry required by the PICmicro MCU to operate: 5-volt power supply, oscillator, reset circuit, as well as an RS-232 serial port, 2-line x 20-character LCD module, and basic analog and digital I/O. 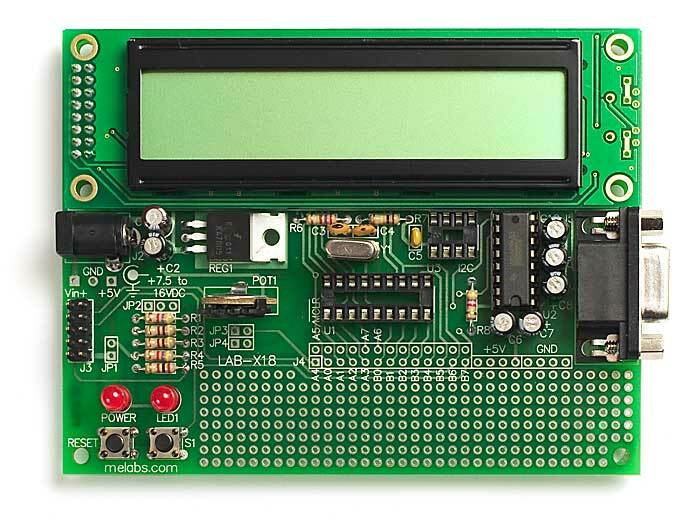 The board is designed to accommodate 18-pin MCUs, including the popular PIC16F88. Many different projects may be created using the LAB-X18. Some examples include LCD clock, servo controller, LCD backpack, and many more. The LAB-X18 can run programs written in assembler, C and PicBasic or PicBasic Pro. The in-circuit programming connector allows the resident PICmicro MCU to be reprogrammed on the fly (requires flash device) using programmers that support this feature like our melabs U2 Programmer. It is recommended the LAB-X18 be used with the 18-pin PIC16F88 (available separately). These flash devices may be reprogrammed again and again. Sample programs are included. The LAB-X18 is available in either assembled or bare PCB form. A parts list and schematic are included. Note: The 16F627, 16F627A, 16F628, 16F628A, and 16F648A USART pins do not match the connections on the LAB-X18. For these particular PICmicro MCUs, the LAB-X3 Experimenter Board is recommended.